Grab your helmets, and get ready for a smooth ride. At DC Bike Ride on May 19, bike-riders of all skill levels will have the chance to experience the city from a whole new angle in the region’s only closed-road recreational biking event. The route, featuring 20 miles of car-free streets, starts at West Potomac Park, winds past Washington’s most iconic views and monuments, and ends on 3rd St., between the U.S. Capitol and the National Mall where DC’s own Trouble Funk will greet riders as headliners at the Finish Line Festival. You won’t have to wait until the finish line to get your groove on; funky beats can be found all along the course, says Michelle Cleveland, marketing director for Capital Sports Venture and DC Bike Ride Coordinator. They’re expecting around 8,000 riders this year, Cleveland stresses that DC Bike Ride is an event for everyone from all walks of life and biking skill-levels. She encourages people to register even if they don’t think they can bike the full 20 miles, because it’s not as hard as you’d think—plus, there’s a short cut to double back to the finish line about six miles in. Timika Adams-Sherman, a case manager at a DC law firm, has participated in each iteration of the event, even bringing her 17-and 12-year-old daughters along for the ride. Upon realizing she would never enjoy running, despite her constant efforts, she decided to pick up a bike. For her, the main draws to this event are closed roads, incredible scenery and a family-friendly atmosphere. 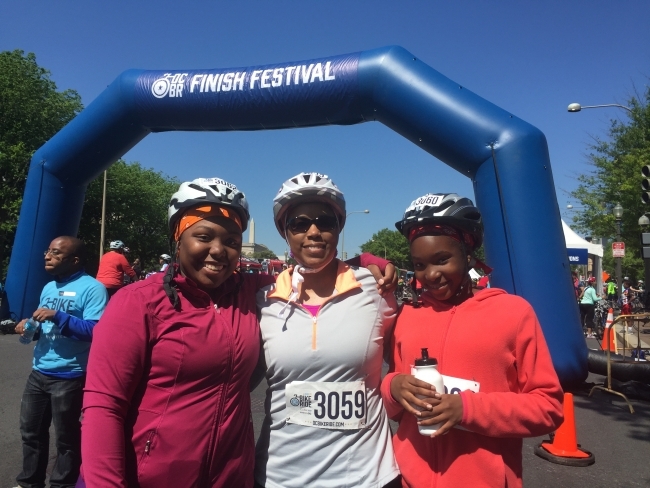 Timika Adams-Sherman and her two daughters at the 2017 DC Bike Ride. Cleveland says that more people like Adams-Sherman see that riding a bike can be a daily activity, and one “not just for men in spandex anymore.” DC Bike Ride is an all-inclusive event, aiming to give people a chance to try out a new hobby while having a blast. Registration for DC Bike Ride ends at 11:59 p.m. on May 16. For more information about DC Bike Ride, visit their website.